By the time Pollaro was 12 he owned a wood lathe and was turning anything he could find into spindles for staircases, batons for policemen, bowls and toothpick holders. By middle school he was building go-karts with axles and steering wheels. In high school he got a job working for a cabinetmaker and later discovered the work of master art deco furniture designer Emile-Jacques Ruhlmann. “I knew then that I wanted to build things that nobody else could build. 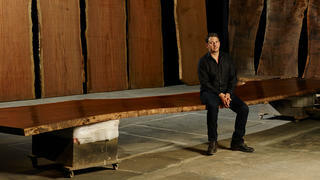 And I’m still doing that,” says Pollaro, 49, seated in his office conference room at a table made from a 650-year-old slab of redwood. Energetic and articulate, Pollaro speaks passionately about his craft. He appears far too young to have been in business for nearly 30 years but, then again, he had already started his business by the age of 21, convinced that he could create the finest pieces of furniture with the finest materials. 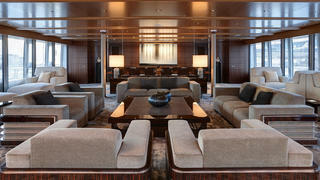 While he has designed everything from a free-form cedar cave-like sauna for Brad Pitt to a $2.4 million custom Steinway piano (6,000 hours, 22 pages of drawings), Pollaro’s attention to craftsmanship and quality has attracted the superyacht industry. After his client Larry Ellison asked him to design and build 94 pieces of furniture for the 88 metre Musashi, Pollaro began collaborating with some of the world’s greatest yacht designers and builders, including Feadship, Lürssen and Bannenberg & Rowell. In turn, the specific nature of yacht design and the commitment to precision and attention to detail has inspired a whole new level of perfectionism in Pollaro. “You want your work to be as fine as what they are constructing,” Pollaro says, explaining that he usually comes into the yacht building process when the boat is in the final stages of fitting. “They will come up with things for us to design. We’ll look at those things and help them engineer them for design and comfort. 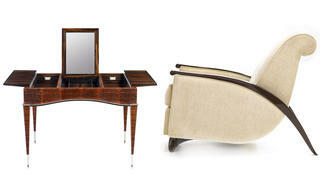 One macassar ebony desk, for example, features 10 drawers each with 50 moving parts. While he may serve a billionaire clientele, Pollaro himself lives a very simple life, not too far from his workshops, with his wife and two-year-old son (another baby is on the way). This down-to-earth sensibility extends to Pollaro’s shop, which is unique among his competitors because he doesn’t believe in automation, which means he doesn’t use computerised machinery. Nothing is outsourced, either. Pollaro has a full machine shop, metal shop, polishing, gilding and upholstery shop. There is even a chicken coop where he harvests the eggs for his eggshell workshop – a technique made popular in the 1920s by French designer Jean Dunand and recently revived by Pollaro, who employs two full-time craftsmen to oversee it. 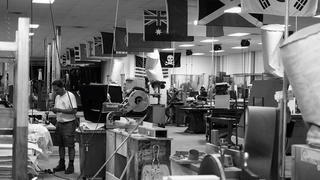 Each year 10 or 15 clients and yacht designers (Pollaro builds only about 200 to 250 pieces of furniture a year) will make the pilgrimage to the Hillside workshops, flying in from all over the world to experience the artisan operation and to ogle Pollaro’s incredible collection of wood – the largest single collection in the world. When visitors come to view his collection, Pollaro will light each slab, one at a time. It’s like a light show in a gallery where the artwork on display is nature’s most unusual and beautiful specimens: five towering slabs of rare bubinga from Cameroon, a cedar of Lebanon that was just purchased by Pollaro’s good friend Brad Pitt (they have a furniture design company they launched together in 2010 – Pitt-Pollaro). In another room, two ancient burred maple columns from Pennsylvania bookend a 400-year-old white oak log from a Venice canal – “that’s a cool tale for someone’s table”. 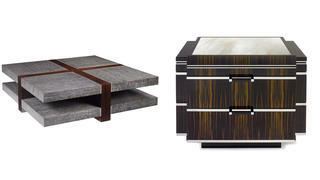 It’s like haute couture for the wood obsessive. When he’s not overseeing production, Pollaro travels the world looking for wood. Sometimes the wood finds him. The table in his conference room, for example, was discovered while stumbling around a barn in northern California. “Sometimes a man will hold on to boards like this for his lifetime and when he gets in his 80s he lets it go and that’s how we get it.” He points to a round slab that will be made into a Japanese table for a garden in Kyoto. Pollaro tries to find boards that are unusually large or unusually figured, such as the 8.8 metre-long claro walnut slab in one corner of the hangar. “That’s a beautiful log,” he says, switching off the spotlight and moving to another room that houses one million square feet of veneer – from the rarest bubinga burr that has a figure “almost like puddles” to wild ebony from Indonesia. Yet another room houses sequence cut logs of macassar ebony, Indian ebony, maple, narra, East Indian rosewood, ziricote, walnut, cherry, Burmese teak – one species per rack and one thickness per shelf. The process is akin to the creation of a ballgown in the Paris ateliers of Chanel or Dior. When a client comes in, Pollaro and his staff lay out six or seven logs of a certain wood. If a client is looking for ebony, for example, Pollaro will choose from 500 unique ebony logs and the client can put their finger on the exact log that will become their table or chair or console.